Nissar gave a wonderful welcome and the apartment was fantastic.. The great AC was priceless considering we visited Roma during a heat wave. The neighborhood was perfect. Full of awesome restaurants and several craft beer places close by. We loved staying in such a hip and happening area! Would go back in a heartbeat! Nissar was the best host we could have asked for. 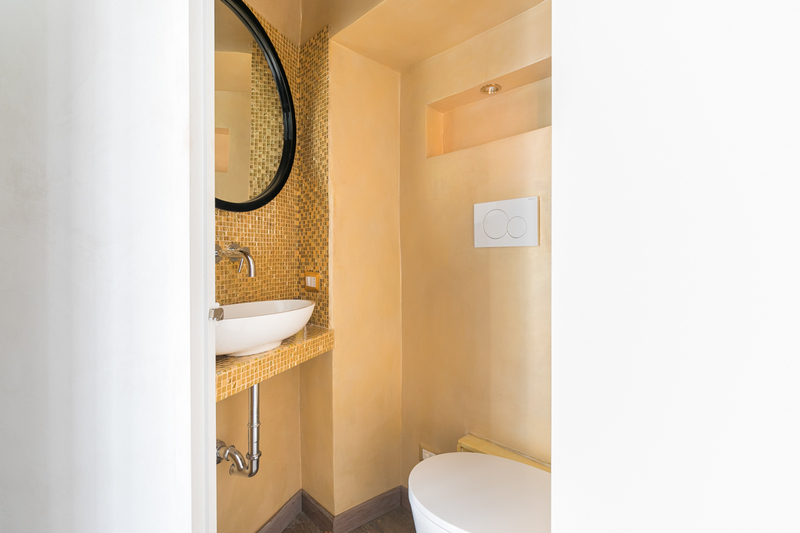 The apartment was fantastically located, beutifully designed, and impeccably clean. Highly recommended. Apartment was in the center of everything you would want to be doing. Better for adults and older children or business people. You can get to any part of Rome within 15 minutes of walking. The locals in the Piazza are super friendly and helpful. very comfortable, two nice rooms with king size beds. 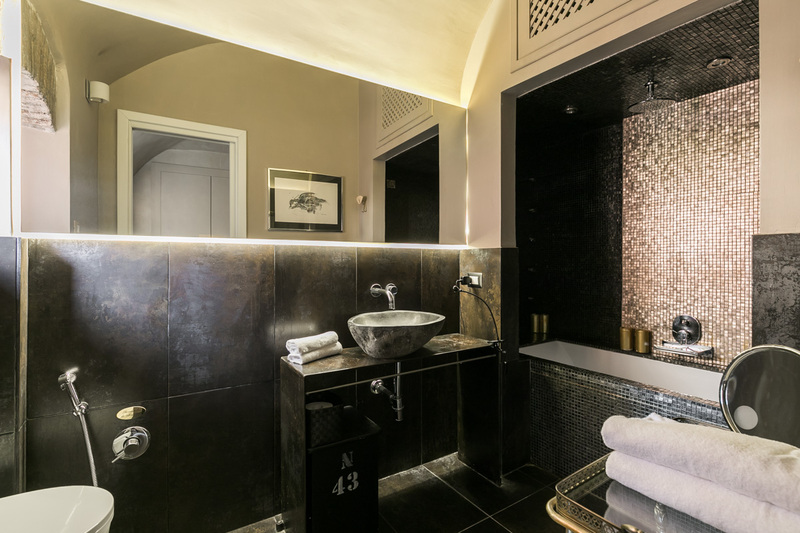 two lovely bathrooms. The kitchen has good equipments. 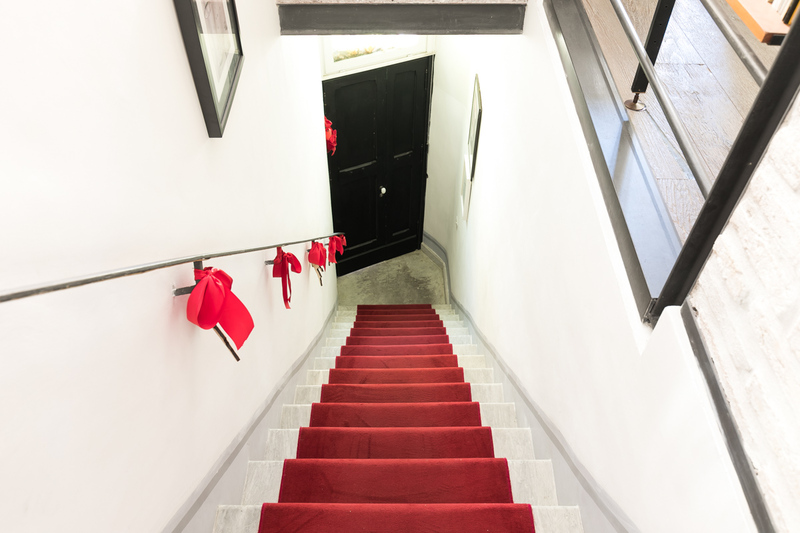 You can find the property on the first floor of an eighteenth century building that doesn’t have a lift. A fully renovated apartment with the best amenities and comforts awaits you. Moreover, you’ll be able to enjoy air conditioning units in all the rooms. In addition to this, high end sound systems, giant flat screen TVs, and Wi-Fi Internet access are at your disposal. 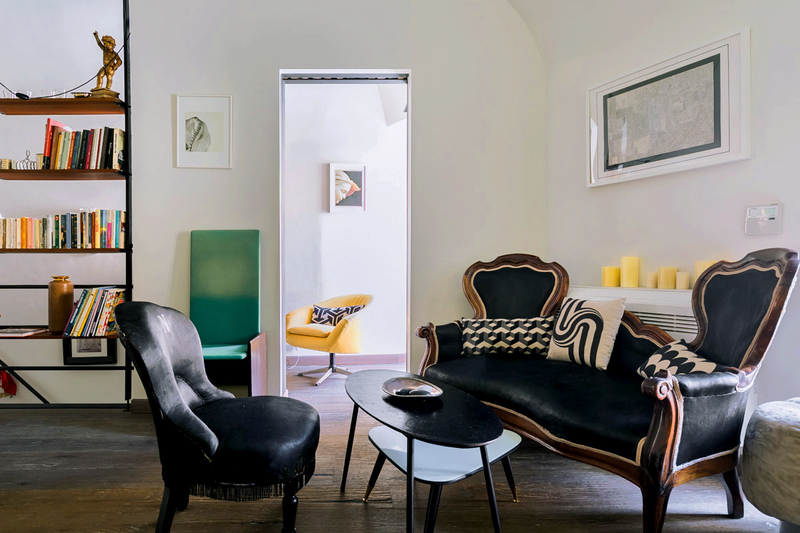 The living room features a couple of comfortable and elegant sitting areas, with velvet sofas, armchairs and a coffee table. Furthermore, one of the sofas can be used as a sofa bed if necessary. 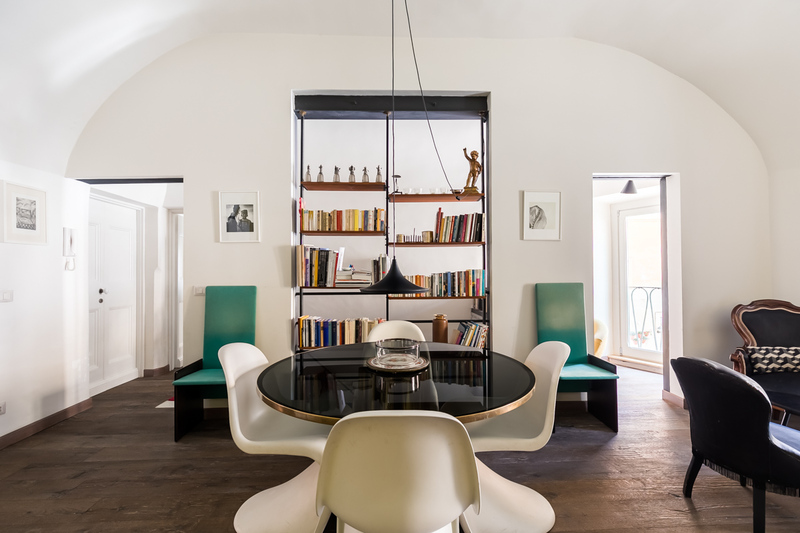 In the same room, you’ll also find a round design table with modern white chairs and a lovely lamp. 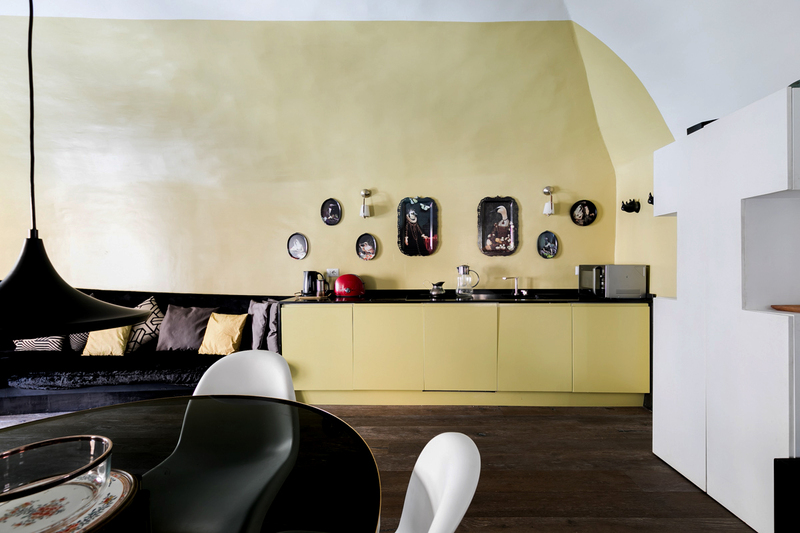 A well equipped kitchenette, with a hidden sink, decorated with original Ibride trays on the wall, offers all you will need to prepare excellent meals. Here you will find an electric stove, an oven, a microwave, an electric kettle, and a dishwasher. There is also a washing machine here. 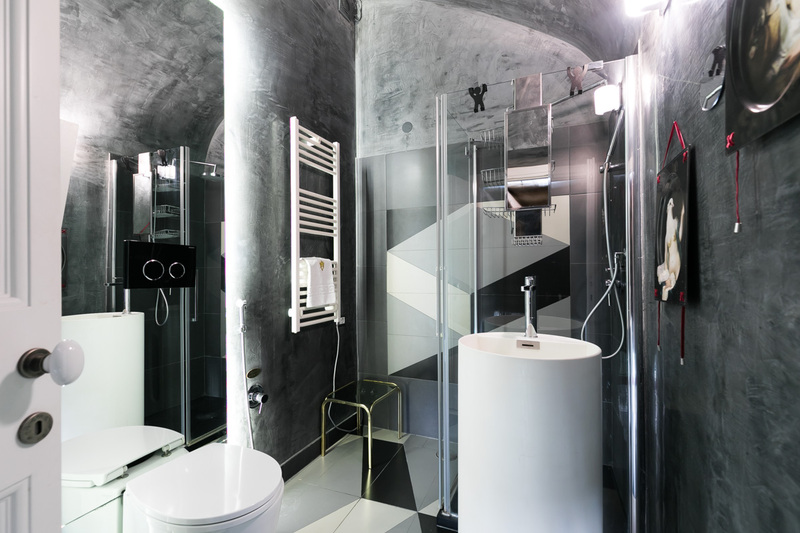 A stylish bathroom with a shower box is situated near the living area. 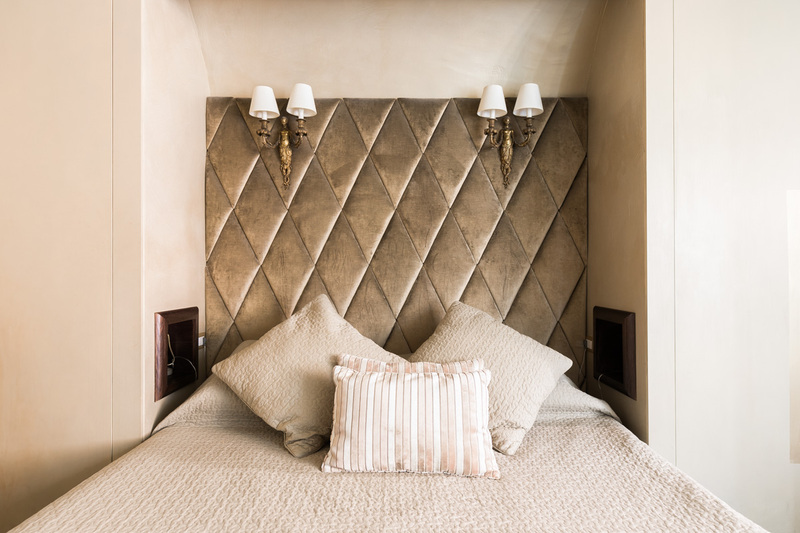 Two chic bedrooms and two more bathrooms complete the apartment. 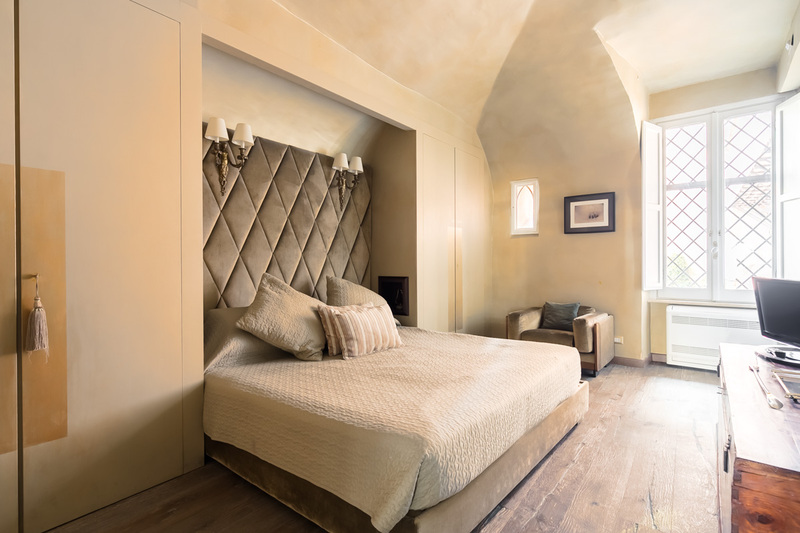 The first bedroom, facing the lovely San Calisto square, has two windows with nice views from which an abundant amount of sunlight enters. 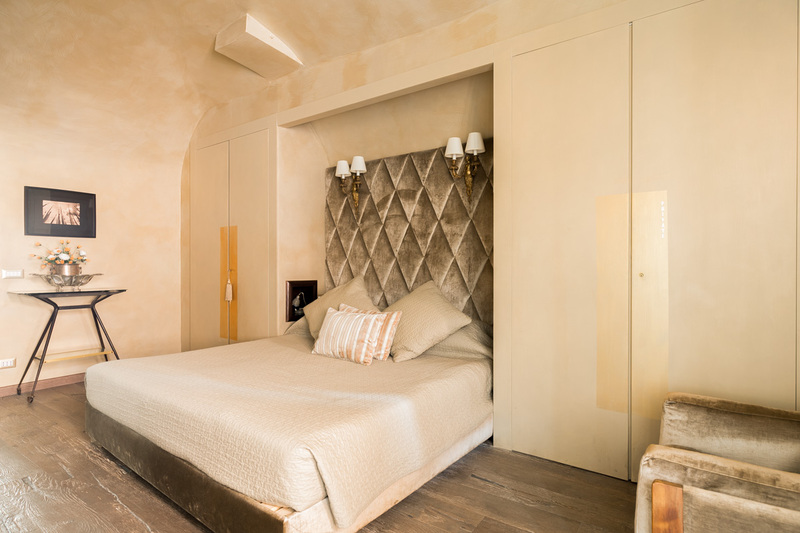 The room features a king size bed, a single bed (used also as a sofa), a Gaia Aulentis design lamp, a modern bathtub, a 52″ flat screen TV and a DVD player. 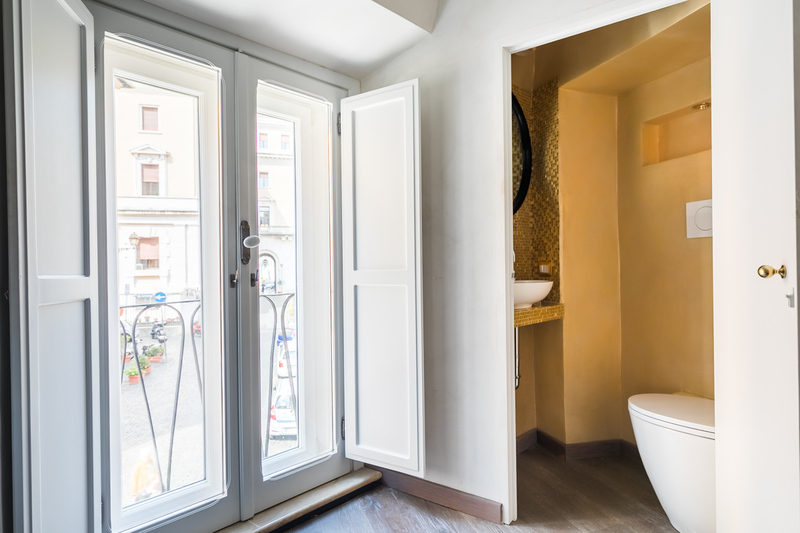 Hidden behind a door that resembles a closet door, you’ll find a small bathroom with a sink and a WC. 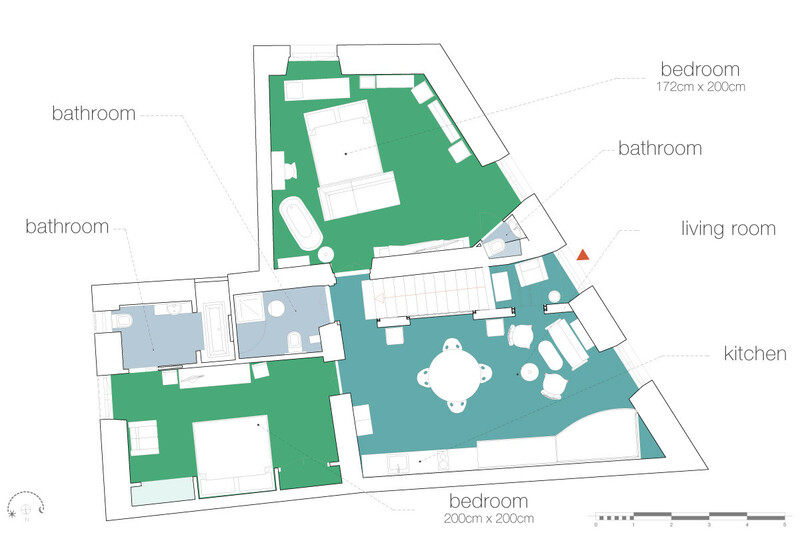 The second bedroom lies in the section of the apartment that doesn’t give onto the square. 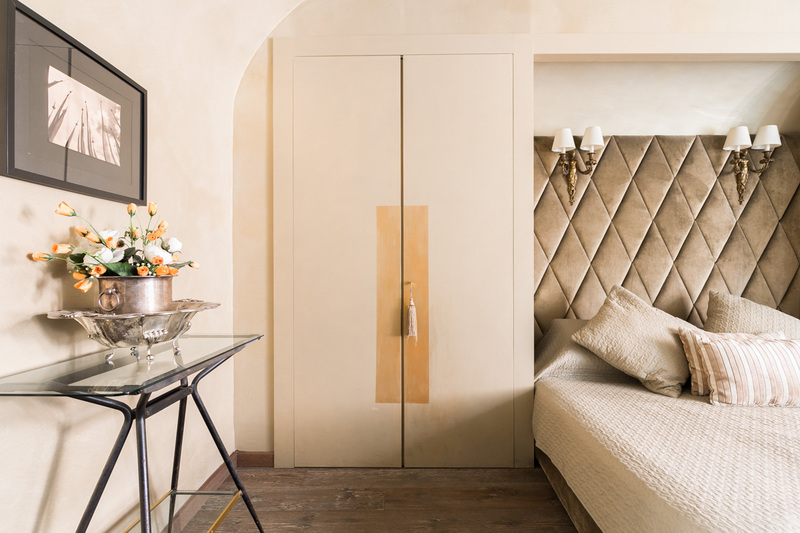 It has a king size bed, a precious gold fabric which decorates the walls, an antique wooden board with a 21″ flat screen TV and several closets. 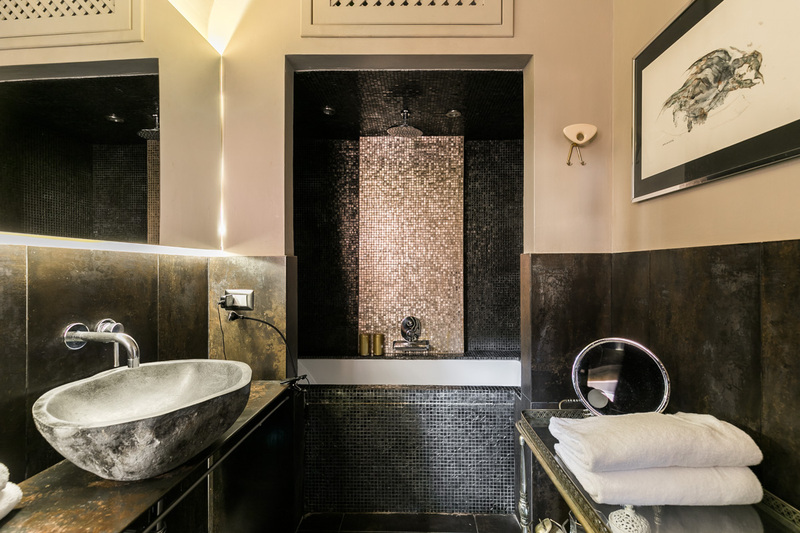 The ensuite bathroom, exhibiting black majolicas, has a beautiful bathtub. 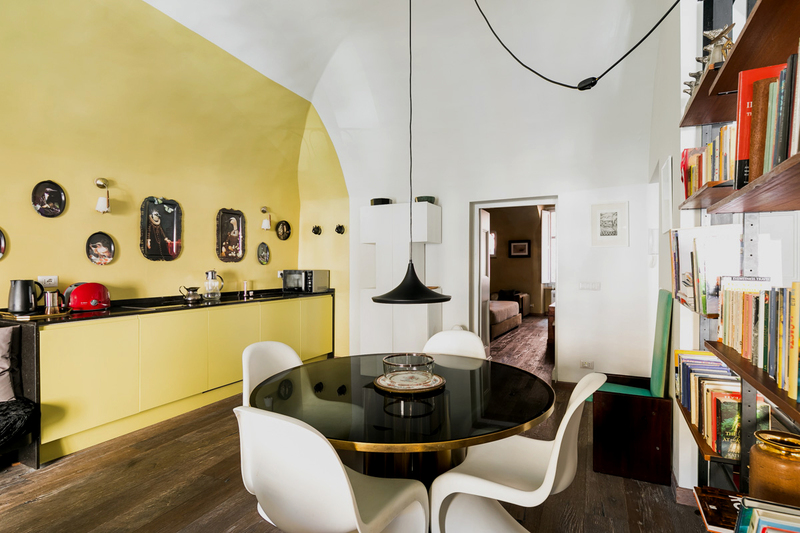 It is difficult to find a better Trastevere luxury design apartment! 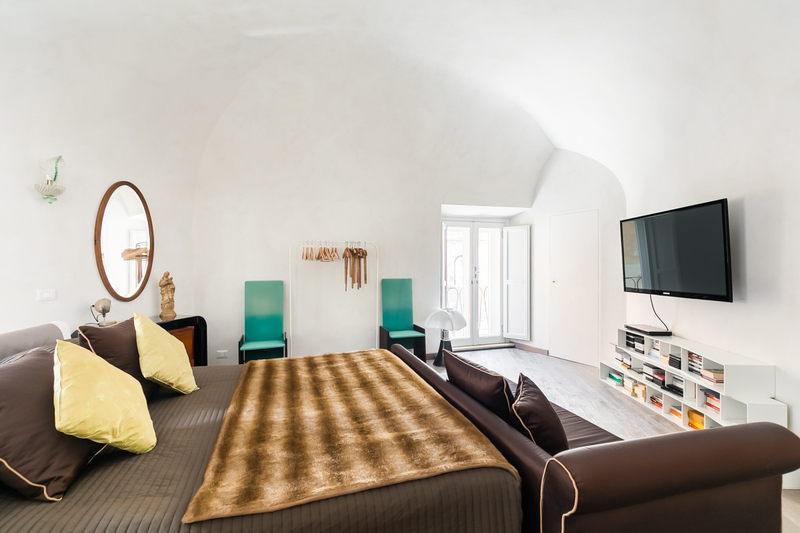 Do not miss out on this Trastevere luxury design apartment. 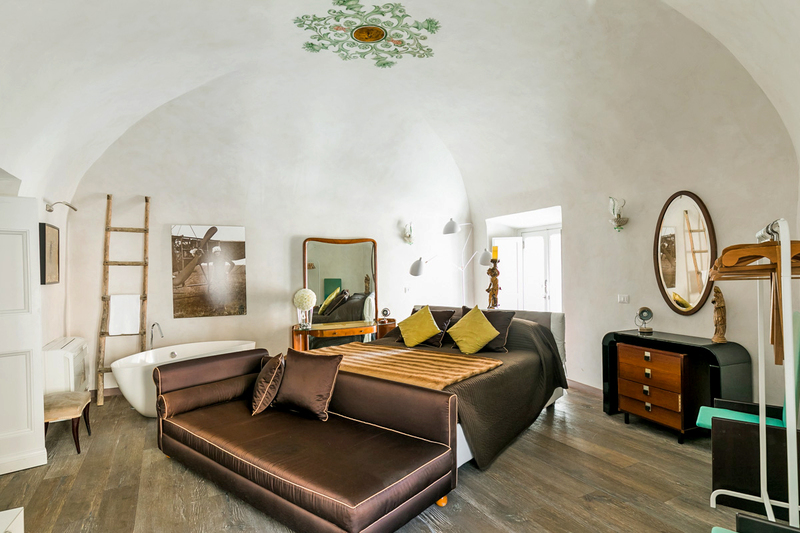 This is truly a dreamy place where to spend a few nights on your Roman holiday! 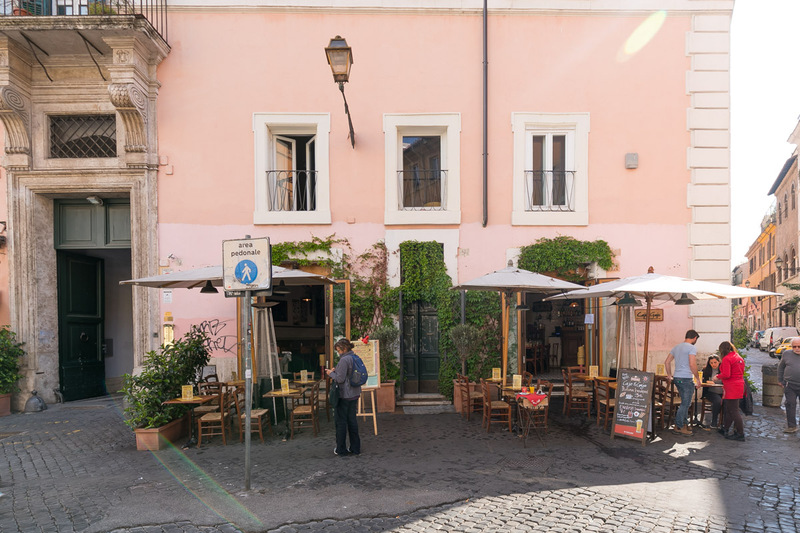 The Trastevere area is one of the most characteristic areas in Rome. It comes alive in the evenings, with its many bars and restaurants. This is the perfect place to have the typically Italian aperitivo and people watch. From here you can also head up the Gianicolo Hill. Though it is a steep climb, you will be rewarded by a stunning view over the historical center. On the other side of the piazzale that you will find at the top, you can enjoy the sunsetting over the dome of St Peter’s Basilica. From Trastevere you will not have any problems accessing all of Rome’s major site. 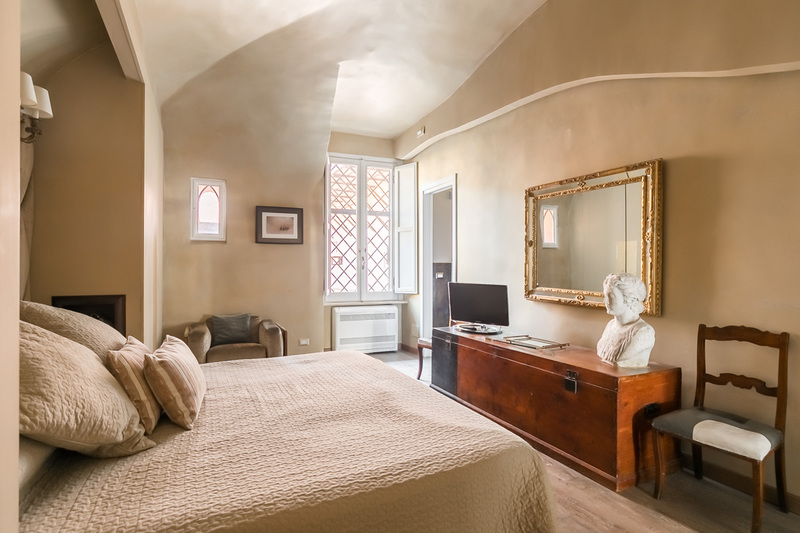 Even the furthest away, such as the Piazza del Popolo and the Colosseum, are well under an hour’s walk from Trastevere. We highly recommend taking a midnight walk through to the Trevi Fountain. Not only will the crowds have diminished in number, but the nighttime illuminations are simply magical! 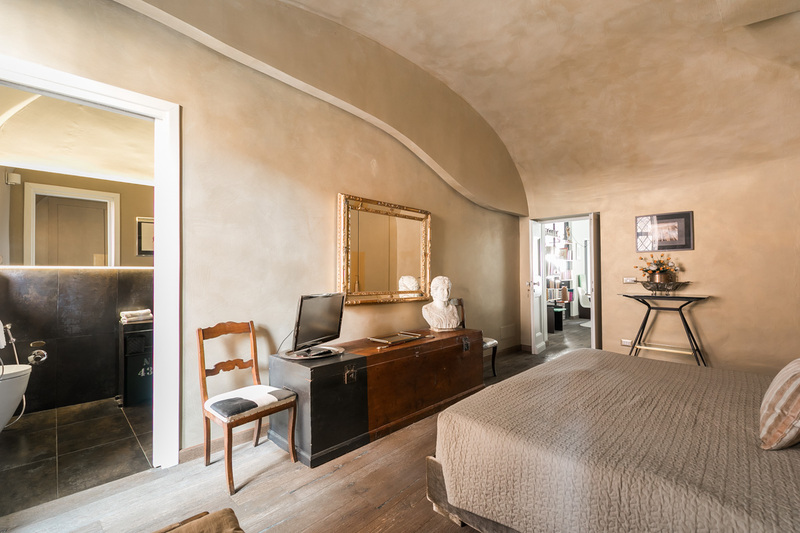 Moreover, just across the river you will find the Campo de’ Fiori/Navona area. These eponymous piazzas and their surrounding areas are lively and atmospheric during the day and at night. The Campo de’ Fiori is especially nice in the mornings, where you will find a market selling many fresh and local products. The apartment is spacious and was very clean. We enjoyed the lively vibe of Trastevere. Although you are in the heart of it, the appartment is an oasis of calm. It is easy to walk to central Rome. Only issue was with the shower over the bath which sends water in all directions. We were welcomed efficiently by Sohail who was happy to organise airpor...Read Moret transfers. We would stay here again. 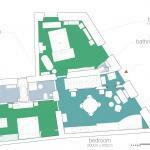 FANTASTIC apartment, FANTASTIC host, in a FANTASTIC location. 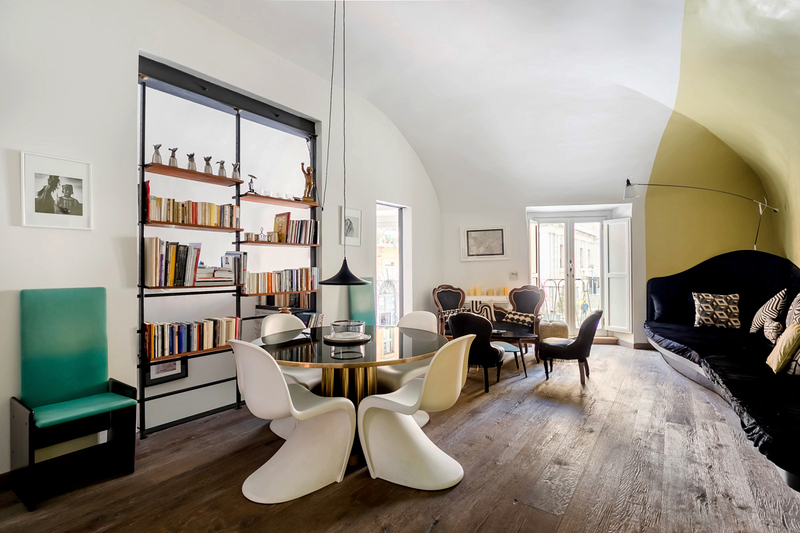 For those who want to be'immersed' in Rome, and all that it has to offer, this is the perfect apartment. check in guy was friendly, accessible, caring and genuine The apartment was clean, comfortable, and well apportioned. The bathrooms were clean, the beds were great, the loun...Read Morege room was well decorated and the kitchen had everything one needs to cook a meal(or more importantly, heat up delicious leftovers!) I would highly recommend this place to travellers that want to enjoy Rome! 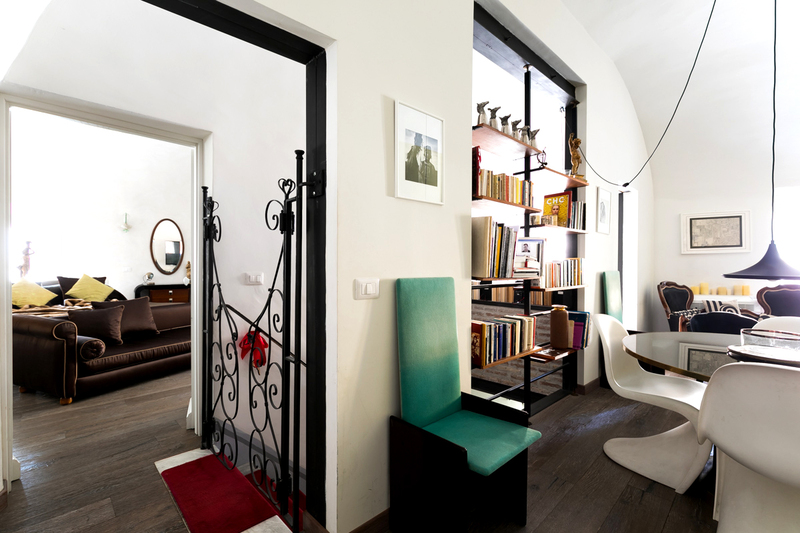 Romeloft was a wonderful agency and the apartment was fantastic... The great AC was priceless considering we visited Roma during a heat wave. The neighborhood was perfect.. Full of awesome restaraunts and several craft beer places close by. Not close to any metro though, but worth it to stay in such a hip and happening area. Would go back in ...Read Morea heartbeat! 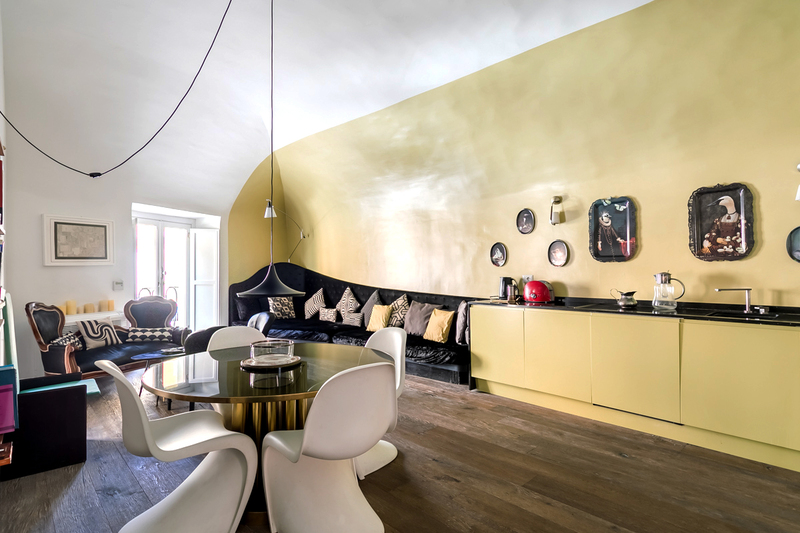 This apartment is wonderful and it is exactly as described. Nissar was there to greet us on arrival. He was most helpful with our luggage. we take a coffee in the cafe below each morning we were there. The apartment is spotlessly clean. The apartment is spacious and air conditioned. 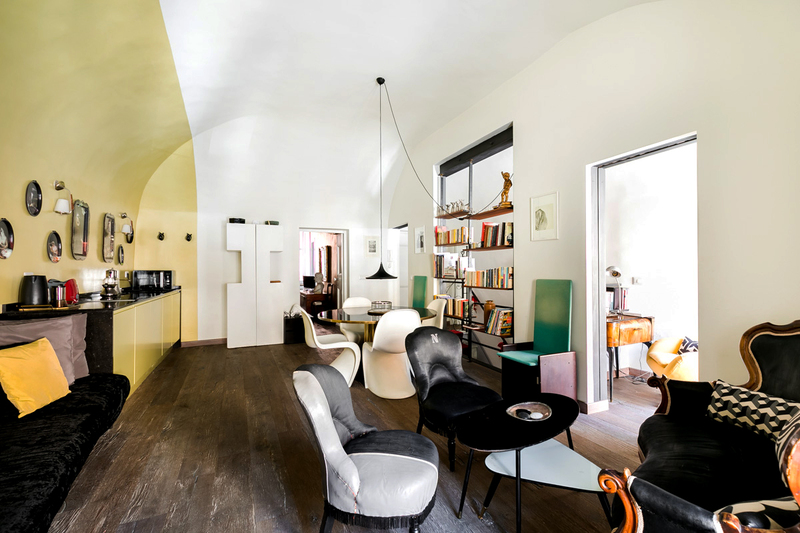 The area Trastevere is simply our favorite place to stay in Ro...Read Moreme. We can recommend this highly enough! the check-in manager was a very polite and positive guy. He helped us with our heavy(extremely heavy at departure) suitcases, ordered taxi and gave us all information we needed. We were grateful for this. 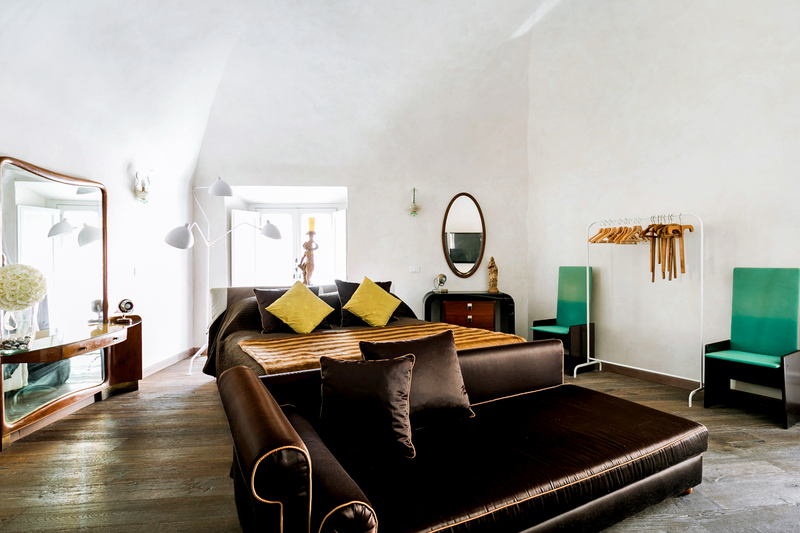 The flat is wonderful with beautiful rooms and delicate bathrooms. And the area is amazing with the lovely atmosphere right outside the doo...Read Morer! When opening the windows you get the nice noise from the square and the lovely people right into the flat then you really feel you are right into all the life in Rome all the time! And the restaurant underneath is fantastic with its great personnel and extremely good! Nissar is a wonderful host who welcomed us with open arms and made us feel right at home. Wonderful location and beautiful apartment. Neighbours are great and got to know them very well. 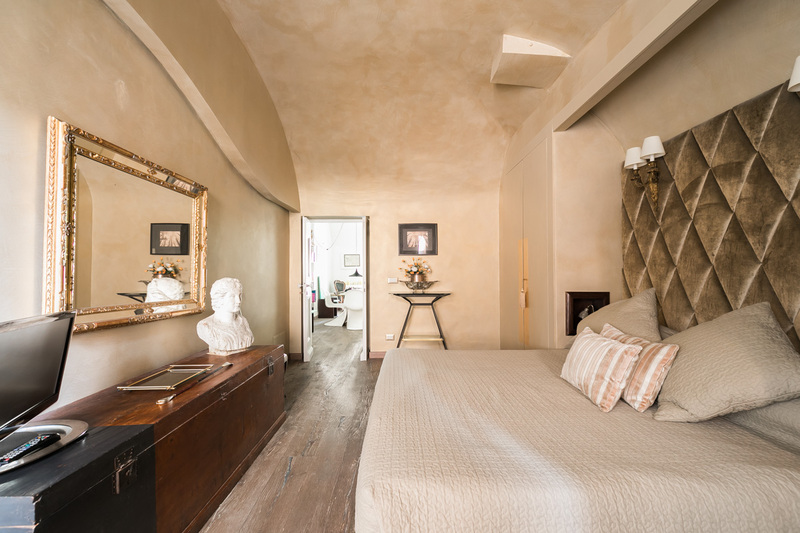 Very close to all tourist attractions and definitely the area to be in while in Rome. 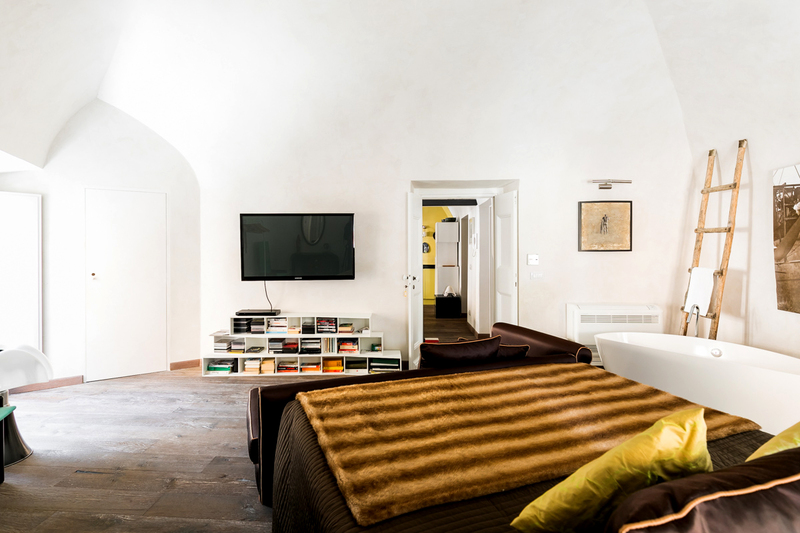 The apartment is definitely the place to stay in and would with pleasure c...Read Moreome back again. Thank you once again! You are great guys. All the best. the check.in guy gave us such a warm welcome on our arrival, we immediately felt at home. He showed us around the wonderful apartment & provided us with very useful information on the local area. 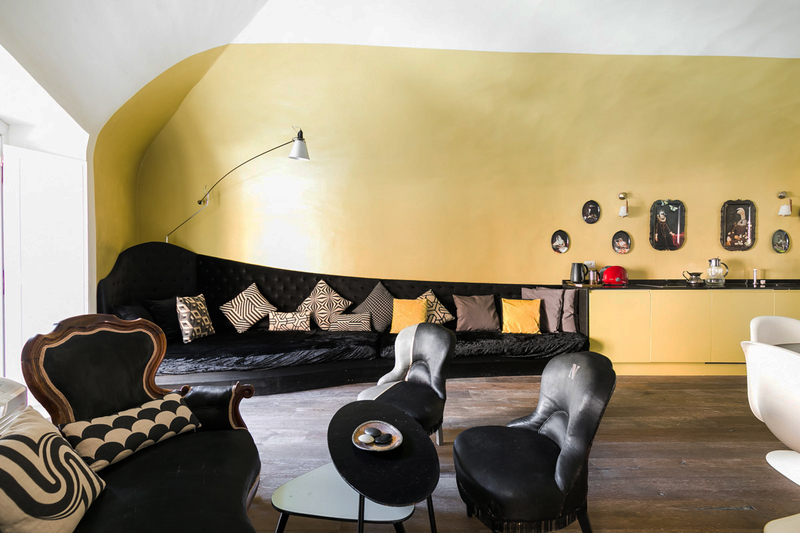 The apartment certainly had the WOW factor& we loved the atmosphere of the location. It was within easy walking distance of all the major to...Read Moreurist attractions. We really enjoyed our trip & would thoroughly recommend staying here!